Located in the Sancti Spiritus province of central Cuba is the UNESCO-listed city of Trinidad. When planning your trip to Cuba, you’ll realize that this city is a must-see and should have a prominent place in your itinerary. Trinidad is where you’ll find brightly colored buildings, uneven cobblestone streets and exciting day-trip excursions. The plazas here are well manicured, the back streets make for exciting exploration, while the options food and accommodation are plentiful. This colonial town may not be the hidden gem that it once was, but it’s definitely worth a visit. We always recommend that independent travelers to Cuba stay in casa particulares, which are registered homestays. In Trinidad, there are many options for accommodation, but we highly recommend booking your room ahead of time in this city. Arriving by bus, you’ll be swarmed by hustlers (jineteros) wanting to show you to one of their casas or hotels that they work for. Be warned, if you choose to go with one of these touts, you’ll be charged extra for your room as a payment for them bringing you to the casa/hotel. To avoid this hassle, just book ahead with HostelsClub, which is the only large hostel/casa website that covers Cuba accommodations at the moment. Casa Bernardo is clean, comfortable and in a great location. The owner — Bernardo himself — is soft-spoken and kind. He’s an excellent chef and even if you’re not staying here, he will prepare a meal if you ask ahead of time. The rooms are large and bright, and each has its own private balcony. Make sure to take a trip to the rooftop for views of the city! Click here to book a room. Address: Colon #355, Between Jesus Menendez and Julio Antonio Mella street. This lovely place is run by the bubbly Mirelis and her husband Edilberto. The rooms here are very bright, large and comfortable. Currently there are two rooms available, with three more under construction. The breakfast here is fresh and delicious and the location is great. 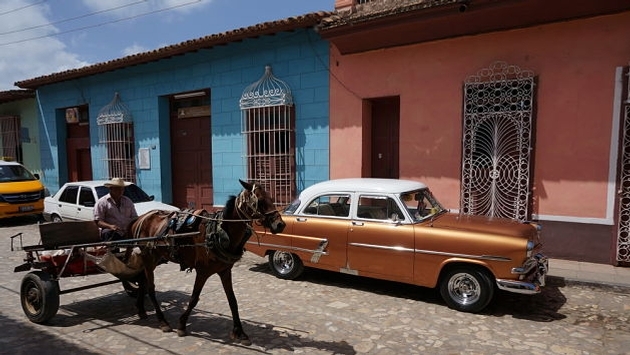 Extras such as laundry and door-to-door taxi service to Havana are also available. Click here to book a room. Trinidad has more restaurants than tourists! When we were there it seemed as though many of the food spots were empty, while others were buzzing. It’s important to eat where it’s busy to ensure you receive fresh food. So, just walk around until you find a spot that looks appealing. We highly recommend eating at your casa, but if you want to go out for the evening, we suggest La Botija Tavern, which is open 24 hours and has a two-hour Happy Hour! The tapas here are great and there’s live music nightly. For fresh fruit, stop in at one of the small local stalls. The cost of fruits and vegetables in Cuba should be listed in CUP, rather than CUC — be aware of vendors trying to charge you extra. On the main intersection leading up to the Plaza Mayor, you’ll find a bread shop selling freshly made rolls and baguettes! These cost just a few CUP each, and if you add some meat, tuna or cheese from one of the local markets, this makes for a filling and easy lunch. The sightseeing here is fantastic! With the stunning Valley de los Ingenios (Valley of the Sugar Mills), and the lovely Playa Ancon Beach just minutes away, there are some excellent excursions available for tourists. Valley de los Ingenios: This series of three interconnecting valleys is massive! The entire area is 100 square miles, and includes 70 former sugar cane mills. During this industry’s peak period in the 18th and 19th century, there were over 30,000 slaves working here. Today, you can hire a horse and ride out into the valley for views of the mountains, waterfalls and old sugar cane mills. There is also a tourist train that runs from Trinidad to the Manaca Iznaga Estate in the valley. Playa Ancon Beach: If you want to avoid the resort town of Varadero, Trinidad’s Playa Ancon Beach is an excellent option. This long, two-and-a-half mile stretch of sand is just a 10-minute bus ride away from the center of town. With just a couple of resorts lining this beach, there are many deserted places for you to lay a towel and relax. If you choose to spend your day where the bus drops you off, at Hotel Club Ancon, you can rent lounge chairs for 2 CUC, and have use of their freshwater shower. There is also a small restaurant here serving sandwiches, pizza and drinks. Go Scuba diving: If you’re interested in getting under the Caribbean waters, head out on a scuba dive. The dive shop is located at Hotel Club Ancon. Always make sure to check the equipment before heading out on a dive, and make sure that the dive masters are qualified. Watch live music and dance: Cuba’s music is intoxicating! Whether you want to or not, you’ll be dancing. Slowly your hips will start to move side to side, and before you know it, your whole body will be alive! Music plays a huge role in Cuba’s culture and it would be a shame to not take part in it. In Trinidad, head to the Palenque de los Reales for excellent rumba dancing and music. This starts at 10 p.m., don’t be late. Note — drinks here are pricier than other spots in Trinidad, but it’s worth the extra cash to enjoy the show. The Plaza Mayor: This is the main plaza in Trinidad, you can’t miss it. The Church of the Holy Trinity dominates the plaza. This is an excellent spot to wander around, or rest your legs on one of the many benches. Get lost: Although Trinidad is a beautiful, must-see town, it can seem very busy. Day-trippers, tourists and Cubans all want to see this lovely place. With hoards of tourists comes much hassle, especially on the main streets. So, in order to avoid this, explore away from the main squares. It doesn’t take many blocks before you’ll find yourself in a quiet spot with no other tourists or touts, just locals going about their day. • Rooms at the casas are around $13 a person, per night. The price depends on which time of year you plan to travel. • Meals at your casa will cost $10 each, which will include a huge spread of food and dessert. • A three-hour horse tour will cost $15. • The bus from town to the beach is $2 return. • A shared taxi van from your casa in Trinidad to your casa in Havana (door-to-door service) is $25 a person. Does Trinidad sound like a city that you would like to travel to? Share with us!